Tainting premium liquor with Gristedes tonic water should be a crime, punishable by having to eat Gristedes shellfish. 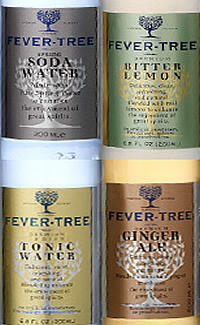 For worthier mixers, try Fever-Tree, just arrived in America. Founded by Plymouth Gin resurrectionist Charles Rolls, Fever uses pure cane sugar and botanicals from the Earth's most random/scary locations to create artisanal buddies for your booze. Already huge in Europe (it's at the "world's best restaurant" El Bulli), its products have become a carbonated grail for mixologists from NYC's Pegu to San Fran's Bourbon & Branch. Fever's four strains: Indian Tonic Water: Ingredients include African marigold, Tanzanian bitter orange oil, and quinine from the Rwanda/Congo border (so the same stuff that protects child soldiers of malaria'll cure you of "a bad case of the Mondays"). Club Soda: "Soft" spring water from Scotland, a land so pure its men don't even comprehend that they should be ashamed of bagpipes and skirt-exposed balls. Ginger Ale: Green ginger from Ecuador, Nigeria, and Cochin, the first European colonial settlement in India (but apparently not the last). Bitter Lemon: The aforementioned quinine, plus hand cold-pressed orange oils, blended with Sicilian lemon juice. Though it's sweetly delicious, do not ask this lemon juice for a favor. As of yesterday, Fever-Tree's available at Food Emporiums across NYC, so now you'll have to make two stops -- one for mixers, and then back to Gristedes for a rotted shrimp ring party tray.